← Provence, France. Annecy to Tarascon. Taking the chill factor into consideration when we ventured out this morning it felt like minus five degrees. We both thought it would have been a little warmer in these parts but not so, however the sky was cloudless and there was no icy pavements or slush to contend with. As soon as we started wandering in the old town we realised we had found a unique place. The street layout was similar to Dubrovnik and Ulcinj but it had a more worn look as very little serious restoration had been carried out. Within an hour of being in the town Bev started muttering about having to stay additional days to see everything! Heading into the old town. 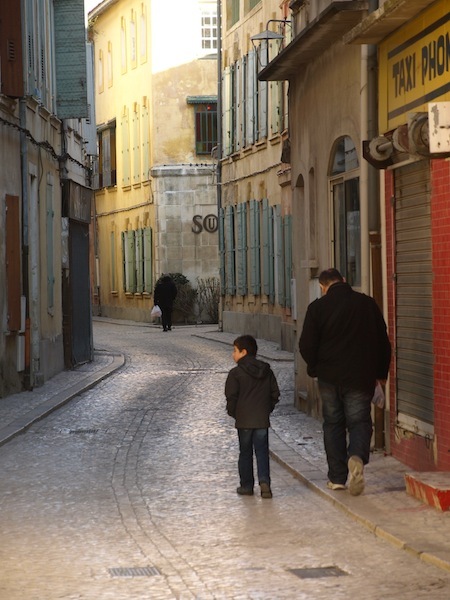 Life moves slowly in the back lanes of Tarascon. ‘We have to stay longer’. 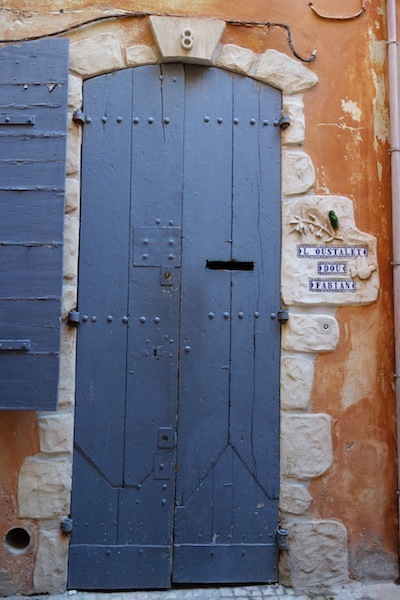 A door with a story. Starting at the top and working down, in this door I see: the two circular objects set on the keystone seem to be porcelain fuse holders; note the number of bolts holding the door to the internal hinges; the large quoin, with an engraved motif of a bird on a branch; the steel plate covering a disused keyhole (to the left of the letterbox slot); the repaired bottom of the door, the rotten section has been cut out. It’s interesting that the rotten section was not cut out straight across but just the bare minimum was replaced, hence the ‘vee’ shape repairs. 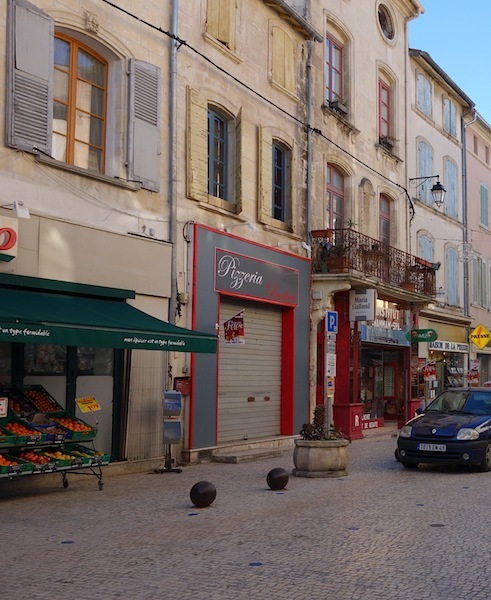 Keeping cars in their rightful place in towns like Tarascon is a challenge. 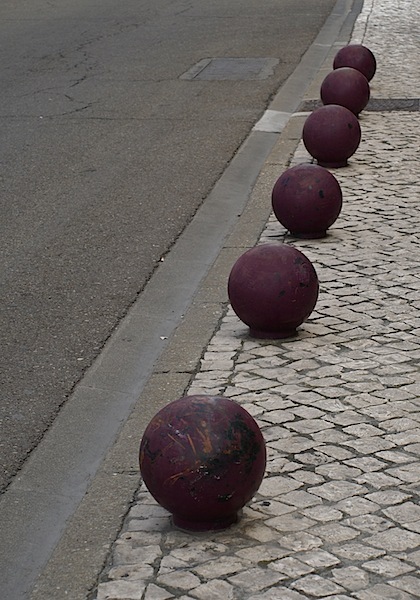 It’s done by placing steel spheres (sump punchers) into the roadway/footpath. Fancy bedroom with a modified bartizan. 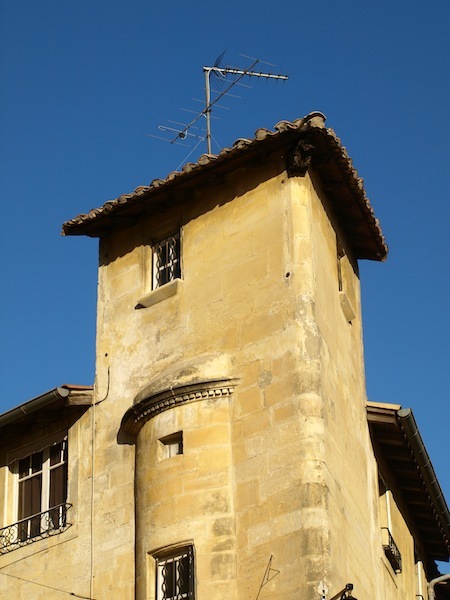 The bartizan is a projection protruding from a wall. 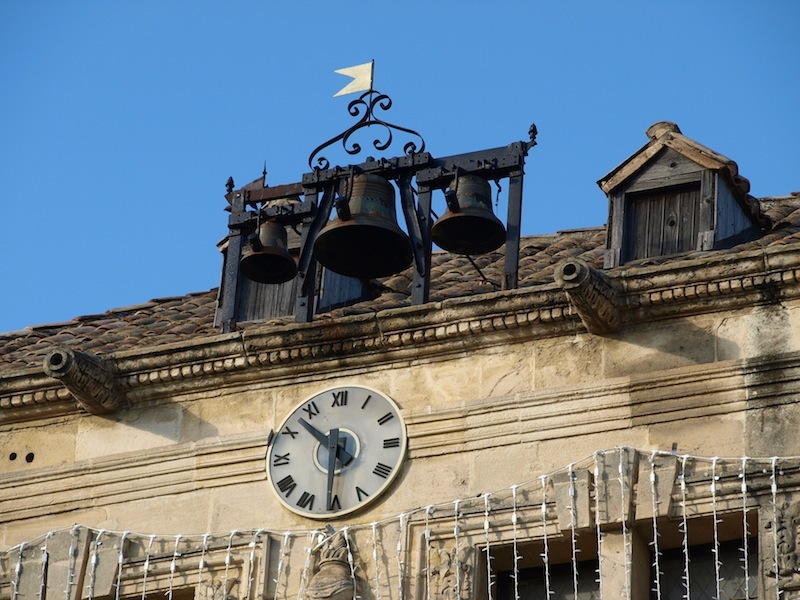 Bells mounted on the roof of the town hall. Note the cannon-shaped gargoyles, the neat dormer window and the blue sky. 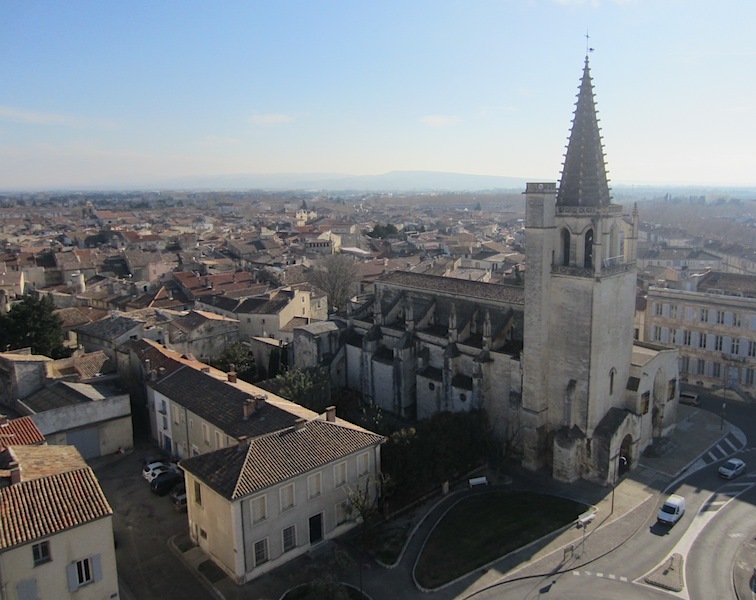 There are two major architectural features in the town and they are the Chateau du Roi Rene and St Martha’s Church. The former protected the nobles of the region from unwanted interference by unfriendly visitors. 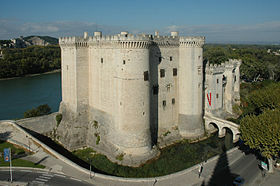 Chateau du Roi Rene (formely a castle fortress) with the River Rhone in the background. Image thanks to Wikipedia. The building of the chateau was a ginormous undertaking. From the angle shown in the photograph above it looks toylike but inside it’s another matter. The building of the chateau didn’t happen in a few short years. 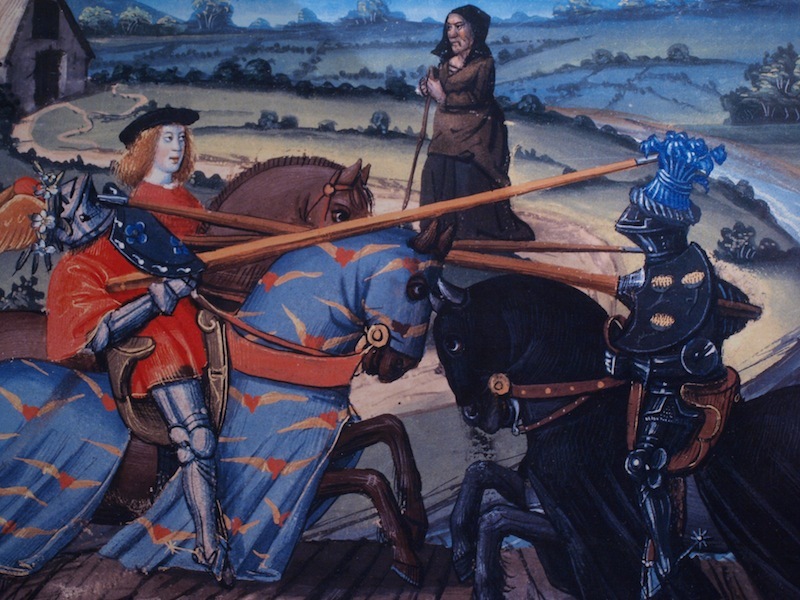 It was commenced in 1400 under the direction of the Count of Provence, Louis 2. Apparently he didn’t see it finished but his sons Louis 3 and Rene 1 continued the work, the latter transforming the castle into a Renaissance palace. In 1481 Provence was an independent state but when it became part of the Kingdom of France Louis 3 and Rene were encouraged to move out. The previous photograph of the castle was taken, I think, from a window part way up the church tower. The entrance to the Chateau du Roi Rene. The castle, after being included in the kingdom, was used as a guesthouse for important visiting gentlemen. Between 1816 and 1926 it was used as a detention centre. In 1936 it was purchased by the French State and restored to its former greatness. During WW2 it was occupied by the German army. 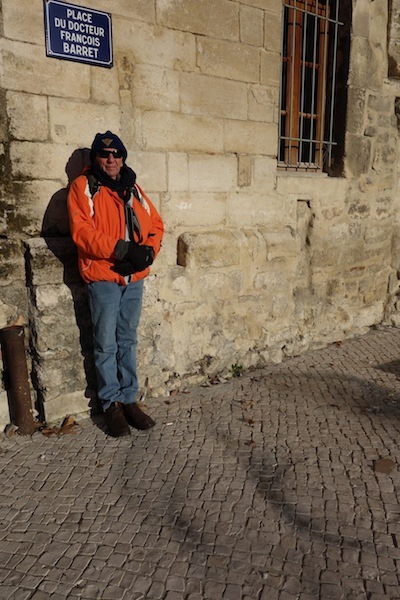 As we wandered around the chateau I thought it would be a horrid place to live in the winter months. How cold it would have been was evident by the number of fireplaces there were. Some rooms had three. 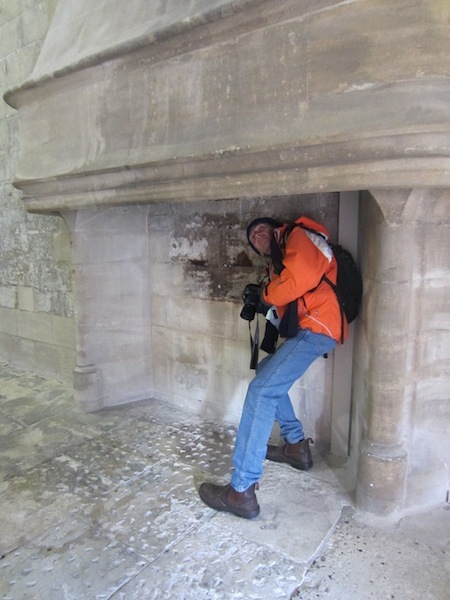 Checking one the chimneys to see if it conformed to the Count Rumford’s chimney theory. I explained the Count Rumford chimney theory in Leg 9 Venice. The inner ward of the chateau. The garderobe, dunny, loo, out house (inner house in this case), bog, jon, Aunt Mary, lav, reading room or toilet. It would have been a bone chilling experience going to the lavatory as drafts would waft up through the hole. Contributions went straight down into the moat below. The bathroom nearby had provision for a fire to be lit under the floor. If you want to read the history of the dunny might I suggest you get a copy of my book ‘Further Down the Back’. Contact www.claycraft.com.au and a copy will be posted to you. The price is Aus $20 plus postage. 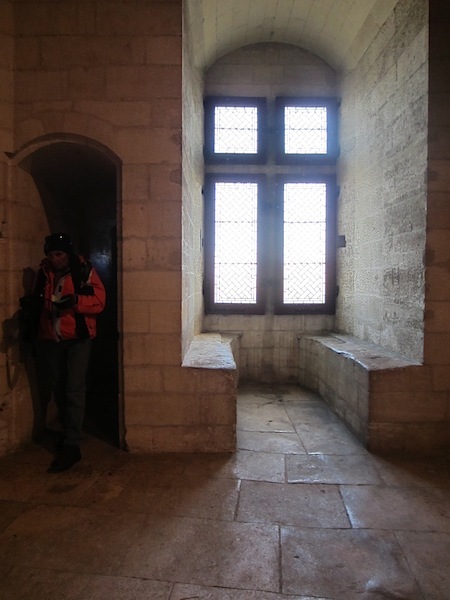 There was one very important design element in the chateau and that was all windows had a sitting area built into them. This was done so every warming ray of the sun could be utilised. The above image shows me coming out of the dunny. Australians call the toilet the ‘dunny’. Dunny is a Scottish word for building on a lower level. Taking advantage of a single beam of sunlight. 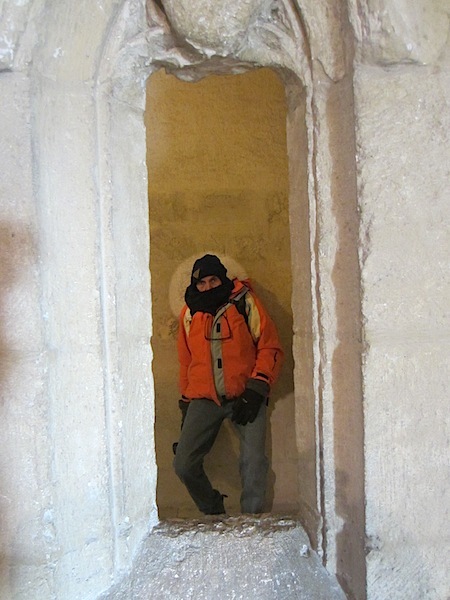 The small room in which I am standing was attached to the chapel. For some unknown reason there was a small circular hole in the castle wall through which a shaft of sun shone through a doorway. In a couple of rooms there were historical displays but unfortunately there was no English translations. I’m convinced the French believe there is only one language in the world and that’s French. I have put my own interpretation on what I was looking at. Defenders of the realm? I don’t know who the old lady is, maybe a referee or are the boys fighting over her favour? This poor bloke is coming down with the ‘dog’s disease’. All he can do is take a Bex, have a hot lemon drink, rub some Vicks on his chest and have a good lie down. Bex pills and powders are an Australian cultural icon immortalized in the title of a 1960s play called ‘A cup of tea, a Bex and a good lie down’. Bex pills and powders were used by Australian housewives to help them get through the day and to relieve symptoms of the common cold. It took a newly arrived doctor from South Africa in the 1960s to recognise that these substances were addictive and that the massive doses of phenacetin (the basis of a Bex) taken by habitual users were causing widespread kidney damage. Vicks Vapo Rub is a camphor-based ointment rubbed on the chest and throat to clear congestion. I attempted via the net to get an English interpretation relating to the above image but I had no luck. However I did turn up some interesting information when I searched ‘bare breasts in religious paintings’. For those interested into delving deeper into this subject go to Art history, the Virgin Mary and breast milk and you will be surprised where the link will take you. 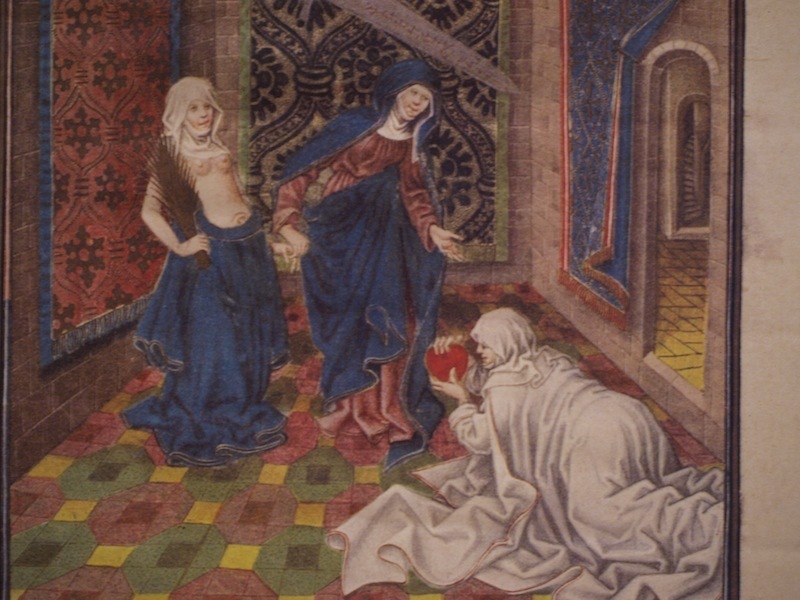 One reference shows the Virgin Mary giving St Bernard (mentioned in the St Gallen leg of this blog) a taste of her breast milk. St Bernard was the bloke who wanted to eliminate gargoyles from churches. Close to the chateau was St Martha’s Collegiate Church (the one from where the Wikipedia image of the chateau was taken). When I first looked at the church I thought the architecture was a bit of a hodge podge. It looked both Romanesque and Gothic. Later in the day, after reading its history, my thinking was confirmed. The following photographs show what I mean. 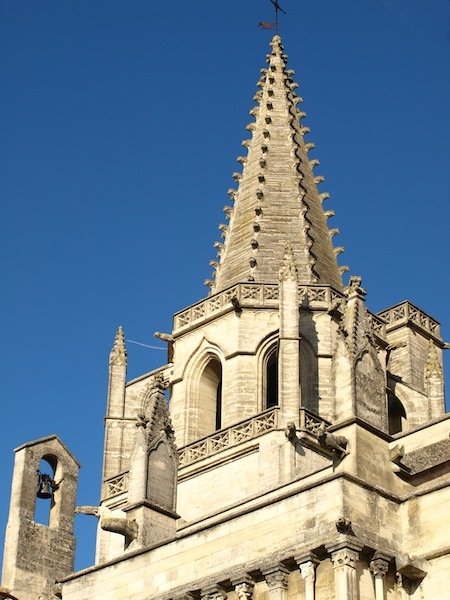 This spire is octagonal over a square tower with pinnacles. The projections from the spire are called crockets. Now I know you will want me to clear up what a collegiate church is. A collegiate church is one where a “secular” community of clergy maintains the daily office of worship. 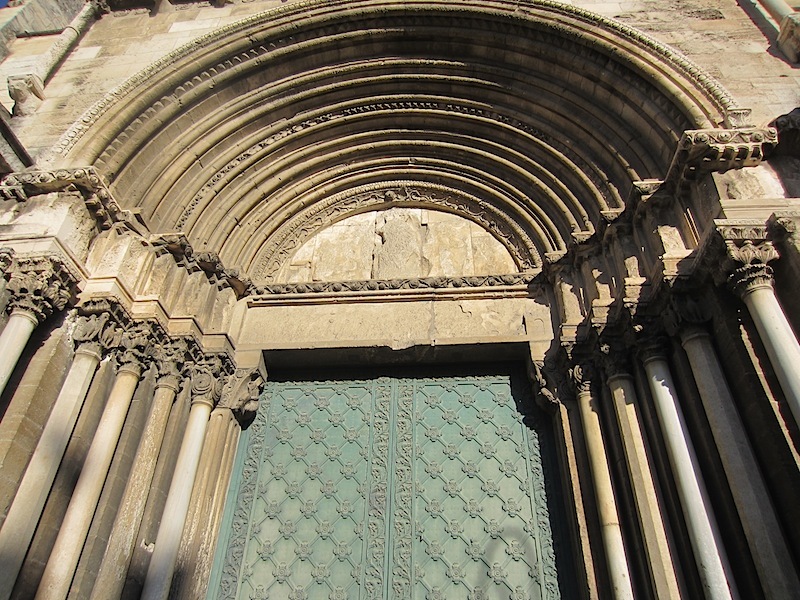 The Romanesque entrance to St Martha’s Church. Rear of the front door of St Martha’s church. What interests me about this door is the similarity between it and locking system on a modern shipping container. It was identical and it was built well before shipping containers were on the scene. 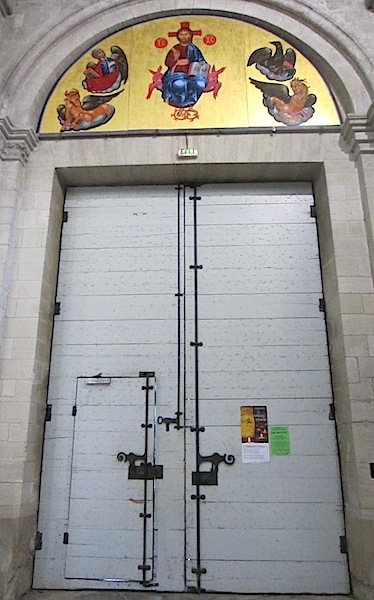 The person-sized door within the big door is called a wicket. The present community of the clergy mustn’t have the ear of those who dish out the funds as some areas of both the interior and exterior of the church were a bit knocked about. At one of the disused entrances of the church there was a mass of modern day packaging rubbish and a rat’s nest. Obviously there is no money available for cleaning. In the rat nest were stone fruit seeds, chestnut shells, small bones and half a wizened up lemon. 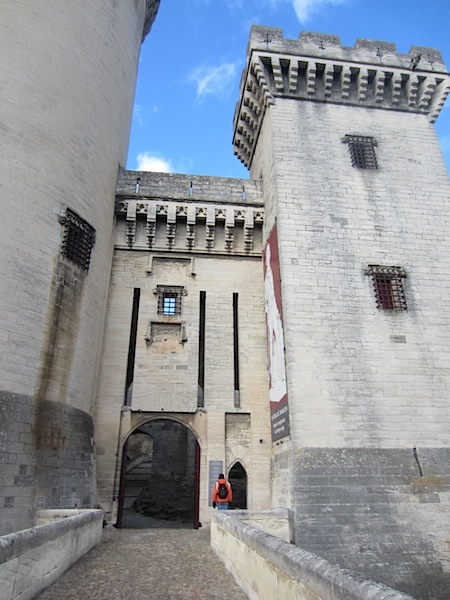 I thought the rat was taking a chance raising its young in public as it is believed that it was at Marseilles, not far along the coast from Tarascon, where rats carrying plague-infected fleas came ashore in 1348. Romanesque architecture is an architectural style of medieval Europe characterized by semi-circular arches. There is no consensus for the beginning date of the Romanesque architecture, with proposals ranging from the 6th to the 10th century. 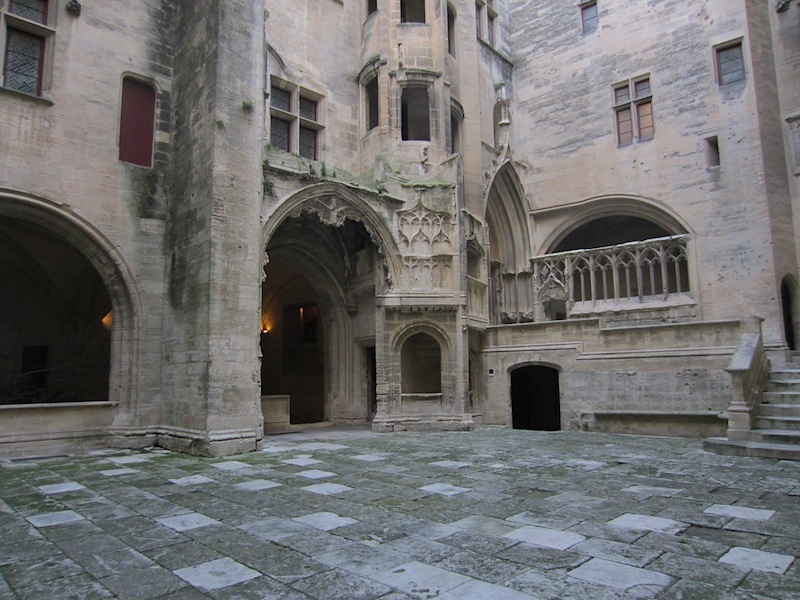 It developed in the 12th century into the Gothic style, characterised by pointed arches. Massive flying buttress at the side of St Martha’s Church. 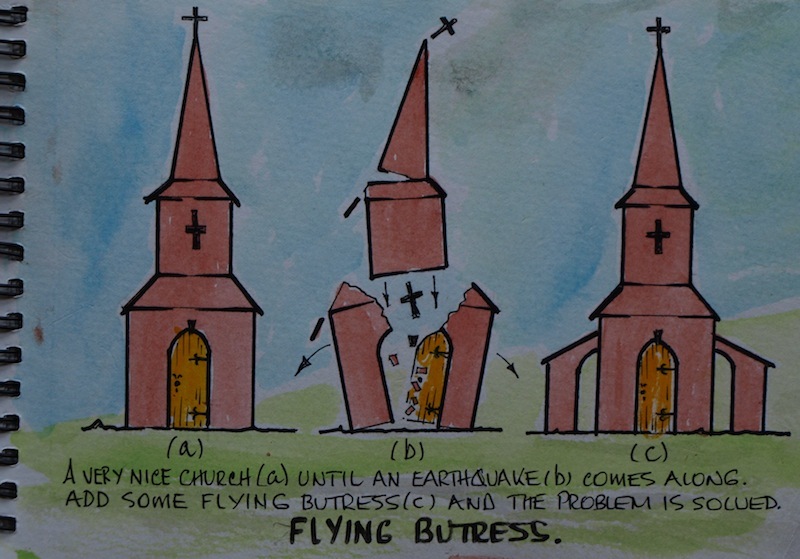 Diagrammatic representation of a flying buttress. 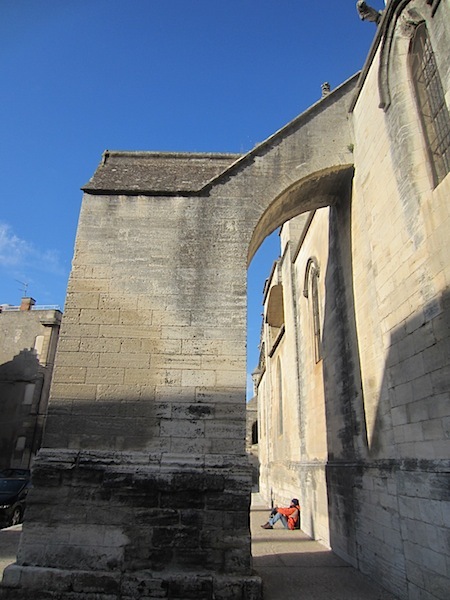 The purpose of a flying buttress is to resist lateral forces pushing a wall outwards (which may arise from stone-vaulted ceilings pushing downwards or from wind loading on roofs). Vaulted ceilings impose tremendous forces downwards, especially during earthquakes or tremors. The Gospel pulpit. Bev particularly liked this one because of its simplicity. In Christian churches there are usually two pulpits. The one on the left (as viewed by the congregation) is from where the Gospel lesson is read. The one on the right or in the centre is called a lectern and the scripture lesson is read from there. 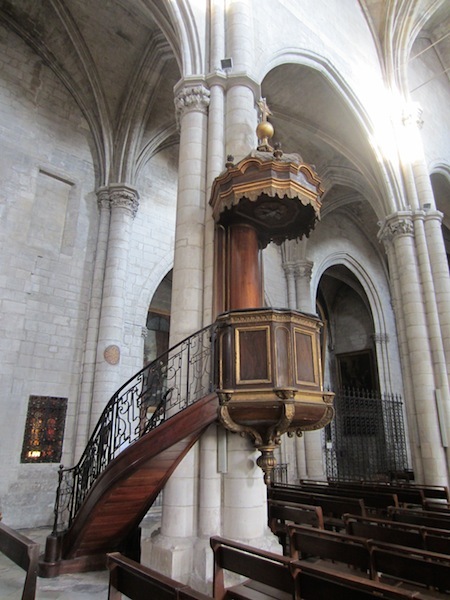 An elevated pulpit such as this one gives the person delivering the message an air of superiority and also being up high on the stage encourages an element of showmanship. It is believed that a man of quiet disposition instantly becomes a dramatic, shouting, hand-waving creature once he ascends to the pulpit. How did St Martha’s Church get its name? The origins of nearly every church in Europe relates to some unbelievable mythical happening and Martha’s church is no exception. The story is as follows. 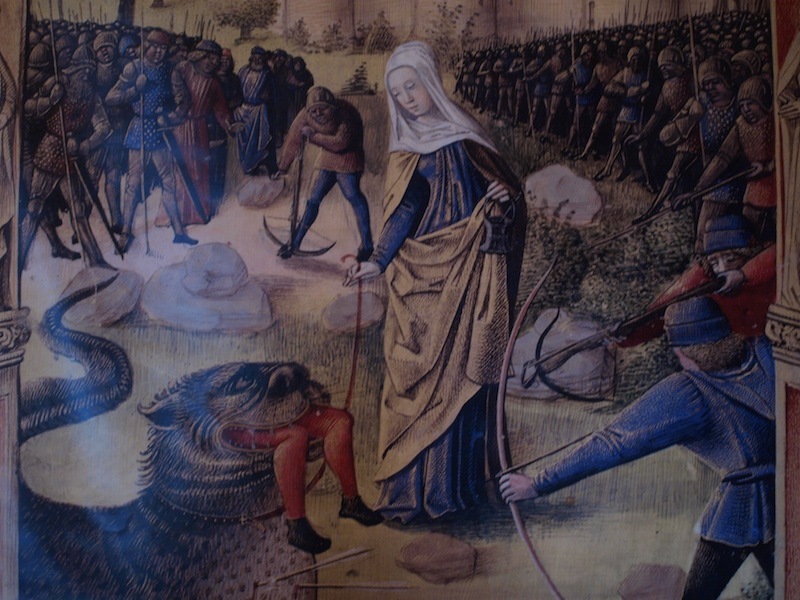 The locals were being terrorised by a beastly dragon but because Martha had supernatural powers she managed to subdue the dragon and bring it to heel. After taming the beast she brought it into town so locals could see it had changed its ways. Unfortunately the locals were not convinced and they killed it. Martha was none too pleased, however she set a good example and forgave them. All around town today there are dragon images. 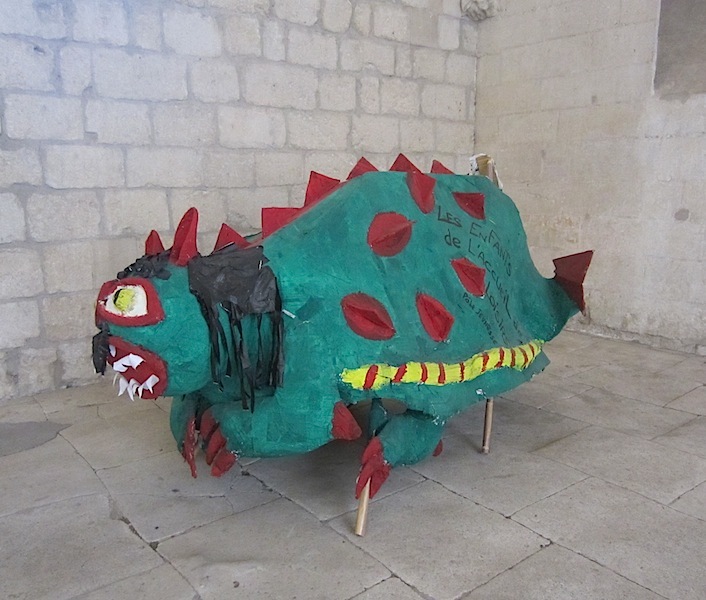 There are fridge magnets, key rings, dragon sculptures, paintings and drawings showing Martha taming the dragon. Here’s slim, delicate, beautiful Martha trying to quell the beastly dragon. 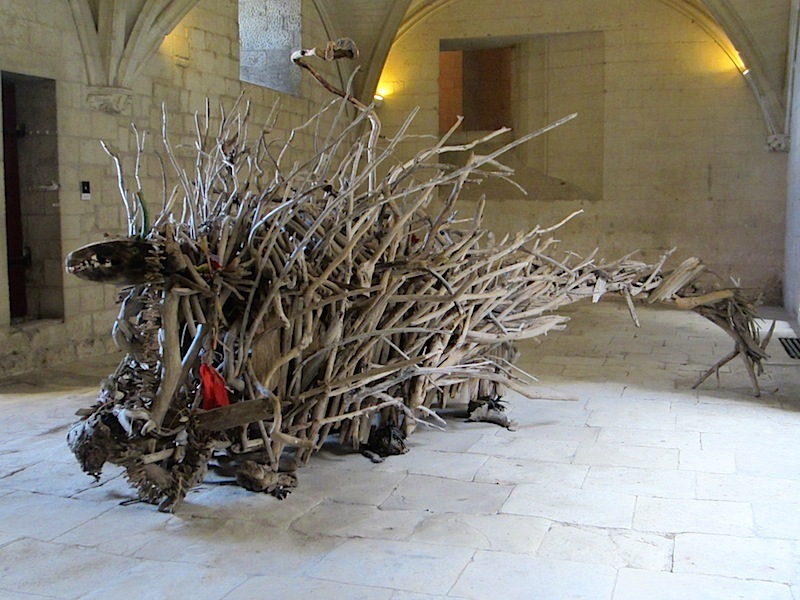 Rhone River driftwood dragon taking shelter in the Chateau du Roi Rene. 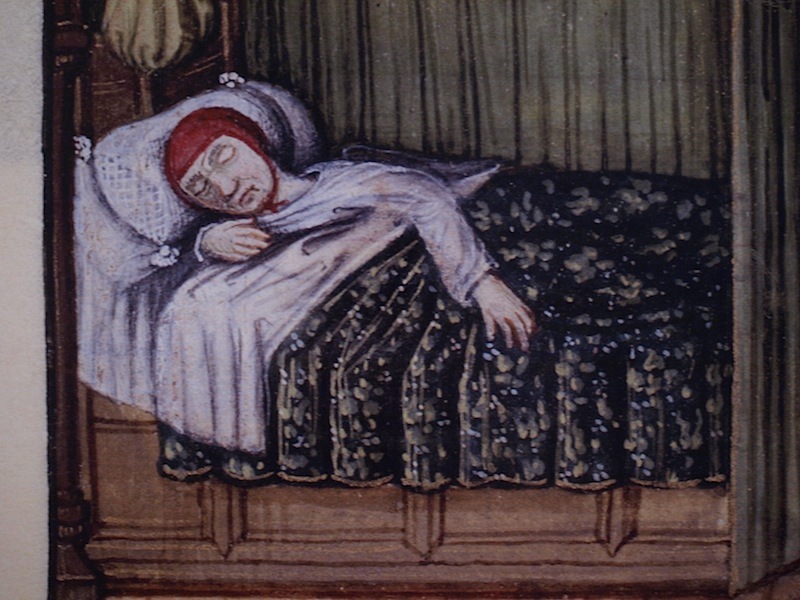 St Martha at rest. 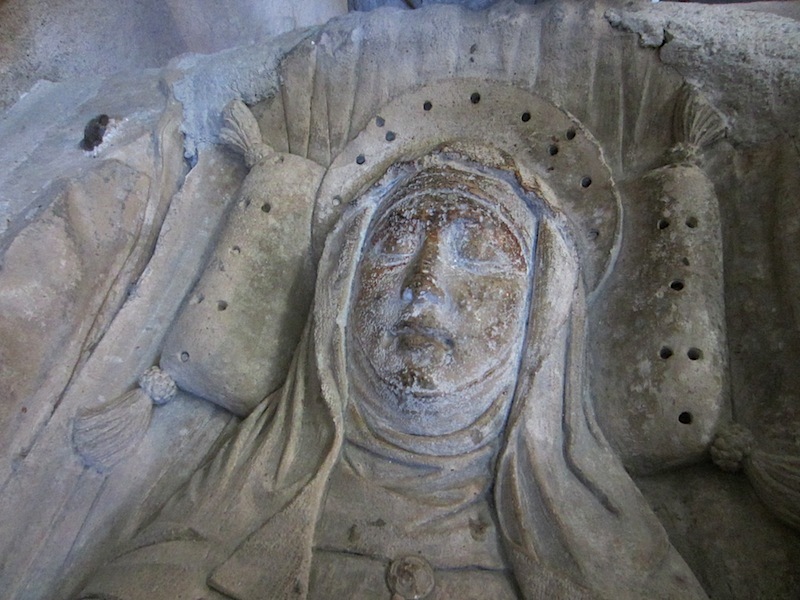 The dark stains on her face are where people have touched or kissed her over the centuries. Well-worn steps to St Martha’s crypt. I find it hard to comprehend how many people have gone up and down these steps to wear them to the state they are. 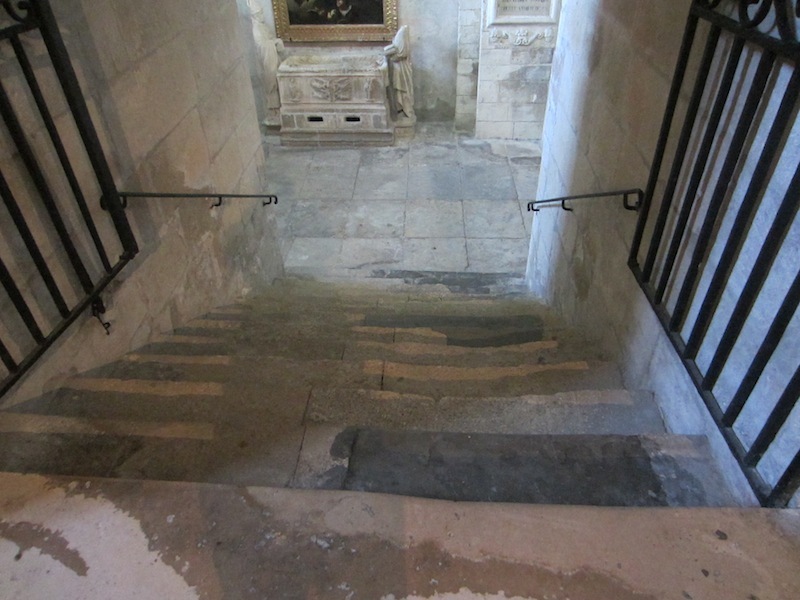 Some of the excessively worn marble steps have been replaced with harder basalt (dark grey sections). 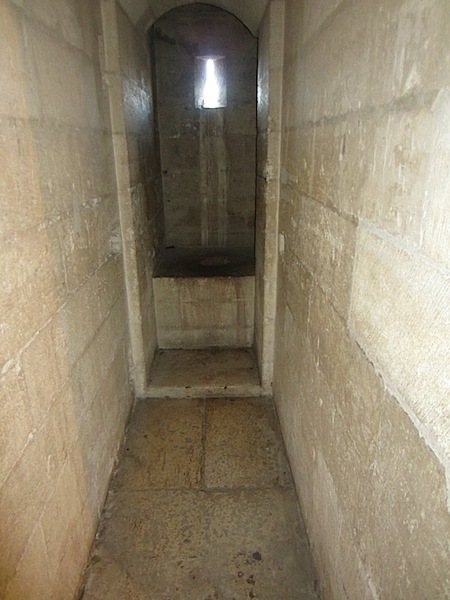 St Martha’s tomb is against the wall at the bottom of the steps. For the steps to wear to this extent she must have been a popular figure attracting thousands of devotees over the centuries. 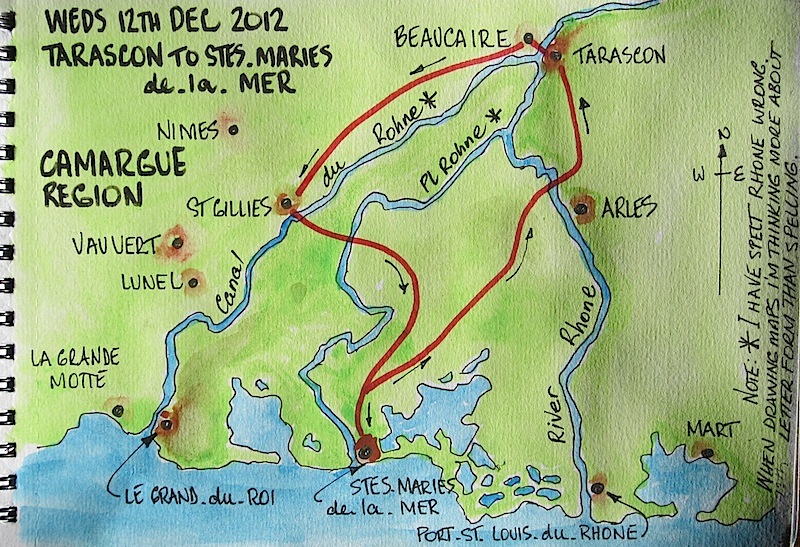 After lunch we drove about 50 kilometres south to Saintes Maries-de-la-Mer where we were told nature existed. I was expecting a little village sitting on the edge of a vast marshland similar to the Macquarie Marshes (Leg 1 Day 1 of the is Blog). How could I have ever thought that! I should have known that in a densely populated country like France the landscape would have been modified. 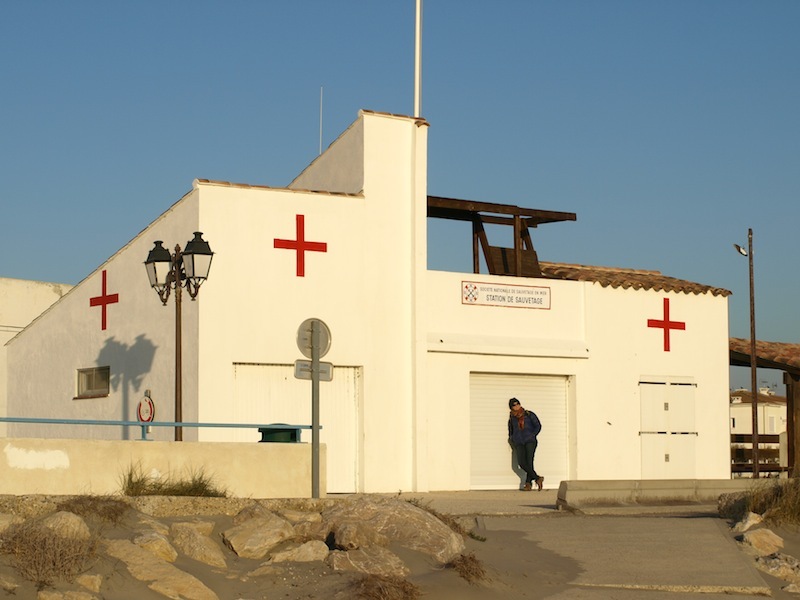 The town of Saintes Maries-de-la-Mer comprised whitewashed houses with Spanish mission tiles (more appropriately Roman) and hotels by the dozens, all having a ‘south of the border down Mexico way’ look. I expected the Magnificent Seven or John Wayne toting six guns to step out through a doorway at any moment. Of course it wasn’t going to happen because 99% of the shops and hotels were closed and many of the houses had the shutters secured. 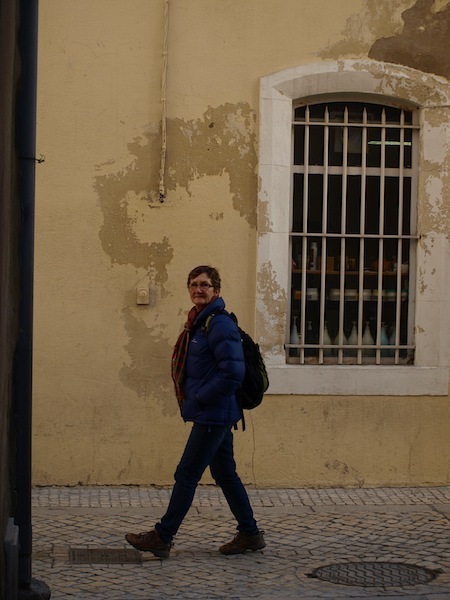 We walked the beach, admired the architecture, peered through a crack in the door of the bull arena and tried to find a café open for a bite to eat, but nothing; everything was closed except for a couple of souvenir shops. Following are some photos around the town. Bev taking advantage of the afternoon sun outside the beach first aid station. The lighting is what drew me to this building. If you enlarge it you will see what I mean. 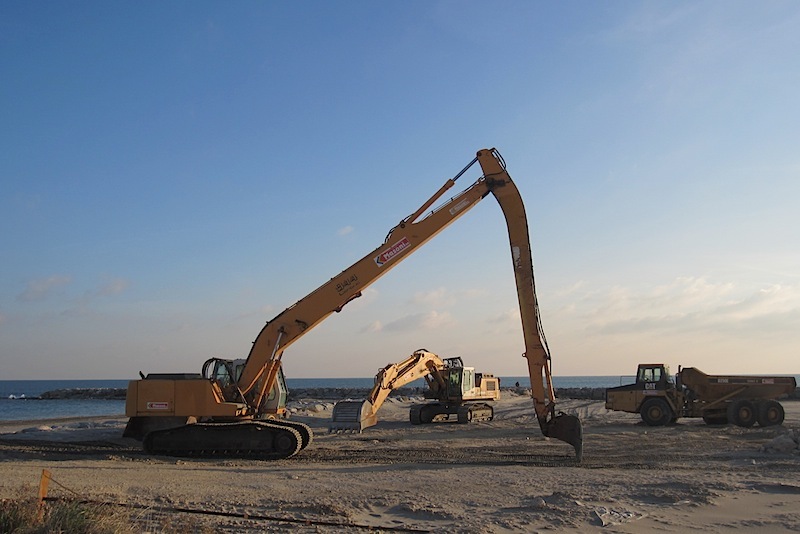 Big movers on the beach. Bev took this photograph initially to send to our grandsons as they, like most little boys are into diggers. However after watching the foreshore protection action here I got to thinking about climate change, rising sea levels and the Mediterranean Sea. 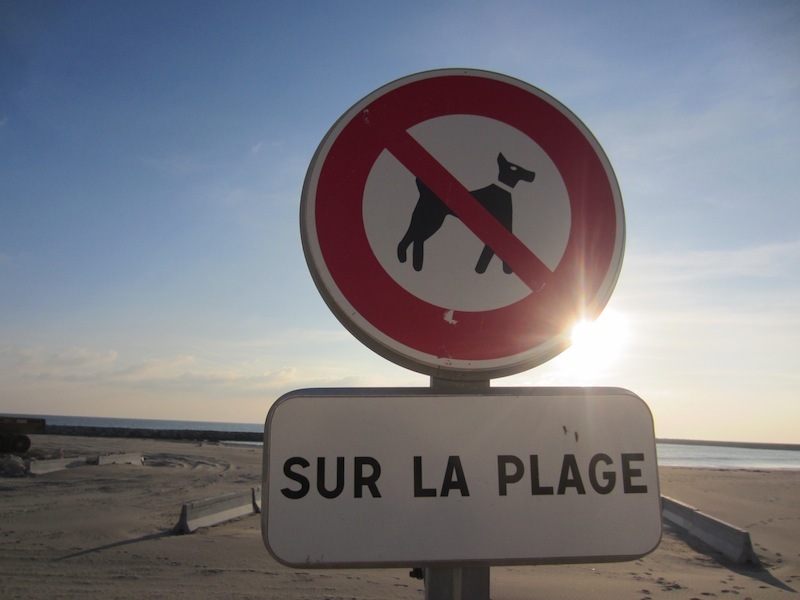 According to a European Commission on Climate Action countries facing the Mediterranean will need to strengthen sea walls, replace beach sands and build anti-erosion structures along foreshores if towns close to the sea do not want to lose some of their front yards. Not only is erosion a problem but salt water intrusion into freshwater aquifers coupled with longer dry periods will put additional pressure on underground freshwater availability. Regardless of rising sea levels, life goes on especially in the commercial laneways of Saintes Maries-de-la-Mer. Following are a few of the souvenirs or sale that caught my eye. A postcard of a black Madonna. I have to admit I have never really thought about black Madonnas. Thinking where white ones fit in to the whole scheme of things has kept me busy enough. 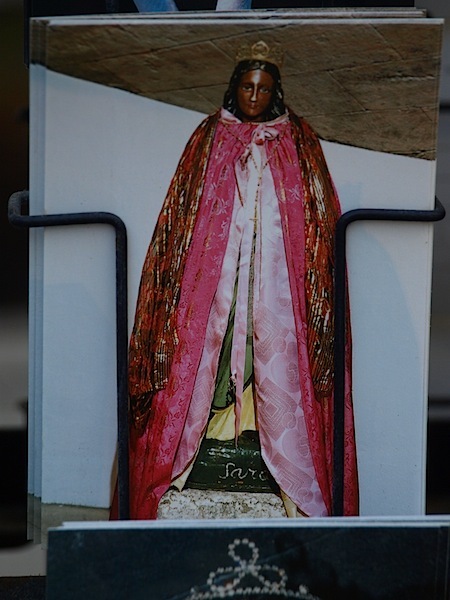 Black Madonnas/Virgins are not women of African descent, but rather tend to have European features. Black Madonnas are usually either statues or Byzantine-style icons of a seated or standing figure. There are about 450 to 500 medieval Black Madonnas in Europe, with at least 180 in France. Ceramic cicadas. I think they should be called Black Madonnas. 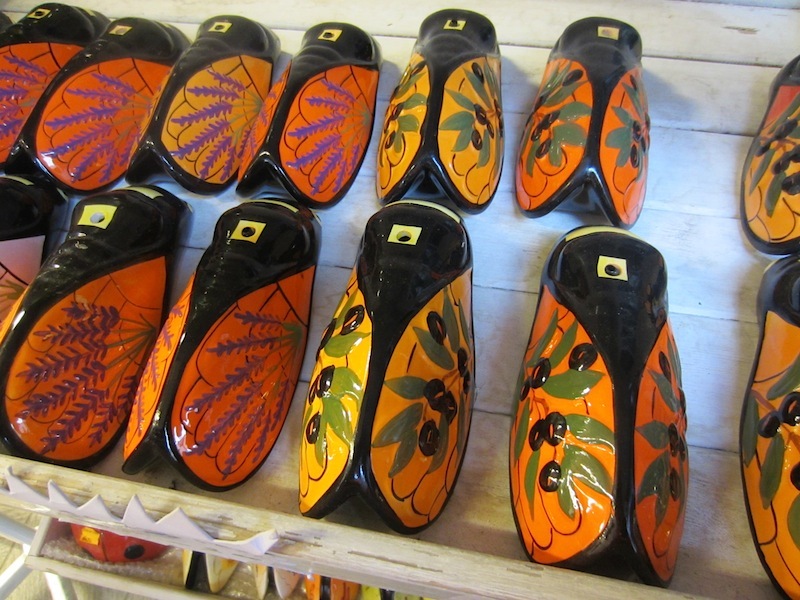 Cicadas are the emblem of Provence and you see them everywhere. Just about every gift shop has them for sale. 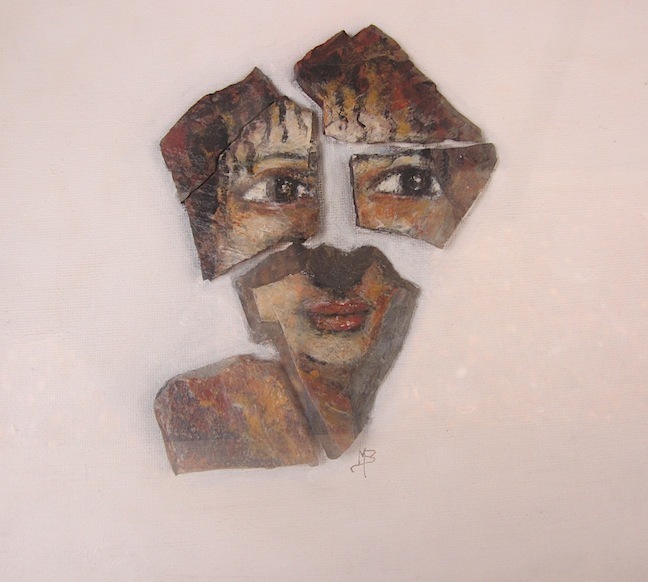 Another piece of local artwork, a fragmented ceramic face. It was just on dusk by the time we left to drive back to Tarascon. 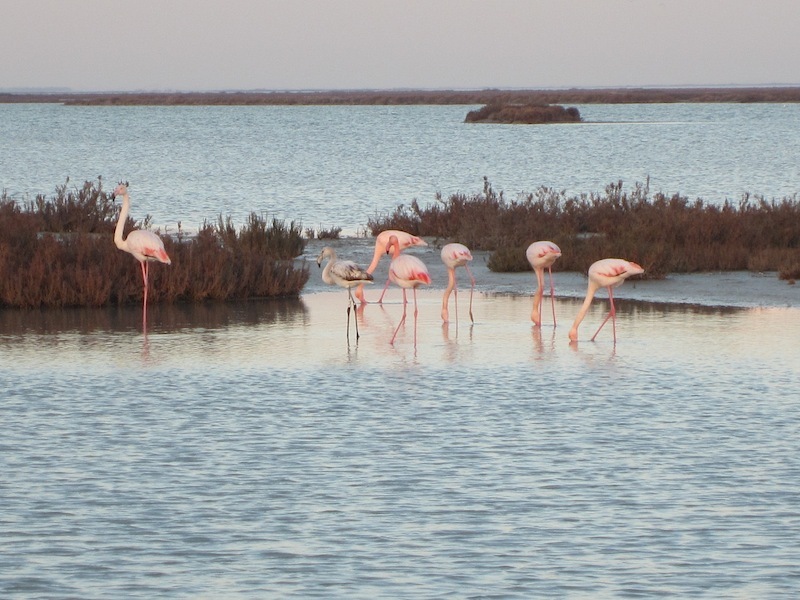 The return trip was around one edge of the estuary where we came across a flock of flamingos puddling the bottom and feeding. You will remember back in Leg 3 Monday 27th August 2012 of this blog I explained why flamingos are the colour they are. It is all to do with carotene in the water. Our first sighting of flamingos in the wild. The Camargue is a vast delta, formed by the bifurcation of the Rhone. The delta is Western Europe’s largest river delta, featuring endless brine lagoons. It is protected from the sea by long sand bars and reed-covered marshes which are home to more than 400 species of birds, including the Greater Flamingo. 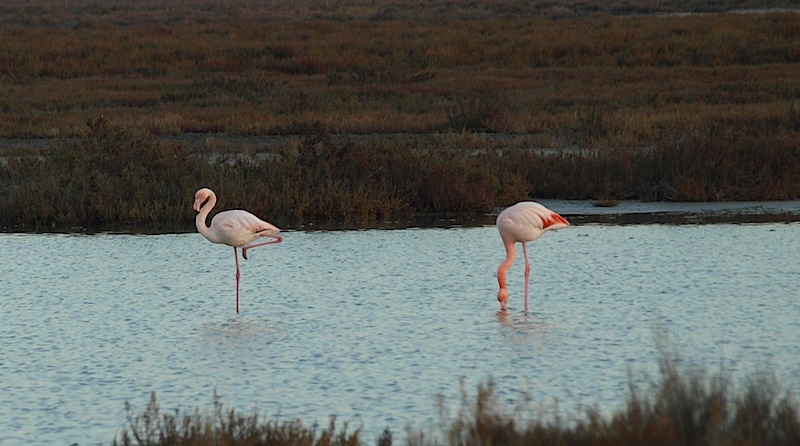 Most of the Camargue is designated as a national park (Parc Régional de Camargue). 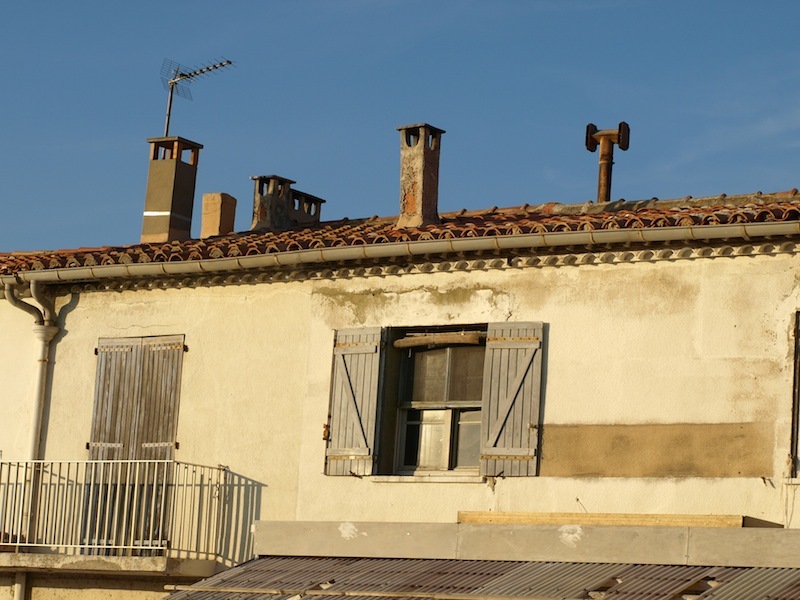 Some of the area is now used for the growing of grapes, cereals and the famous Camargue rice. Rice was originally grown here to desalinate the soil, and reached peak production between 1942 and 1962. Foreign imports began to undercut prices in the early 1960s leading to the abandonment of 60% of the paddy fields. 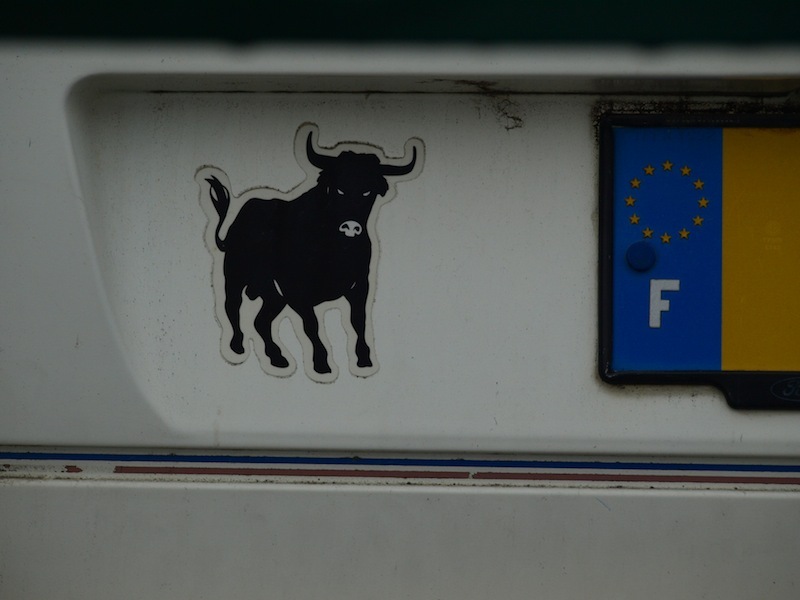 Many Camargueseans are crazy about “la course Camarguaise”, a type of bull-running in which men attempt to pull tassels and strings off the horns of wild bulls running in an arena. It is the men rather than the bulls who risk injury. Another feature the area is famous for is the breeding of Camarguese Black bulls that are sent off to Spain and used in bullfights. 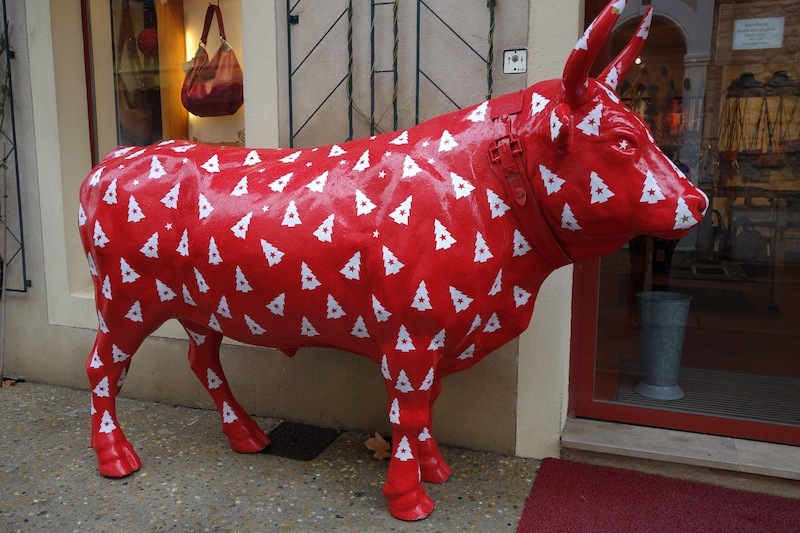 Those involved with the raising of the bulls are known as French cowboys (gardians) and cowgirls (gardiannes). They wear cowboy boots, moleskin jeans, spurs, and wide-brimmed, flat-topped hats. On the way back to the hotel we decided to stay another day in Tarascon as we want to visit the actual mouth of the Rhone. Tonight’s dinner was an emergency one because we didn’t fancy going out in zero degrees. In my backpack I had a packet of dehydrated Back Country Roast Lamb and Vegetables (made in NZ). All you do is pour boiling water into the packet, allow to soak for ten minutes and, presto, a meal for two. 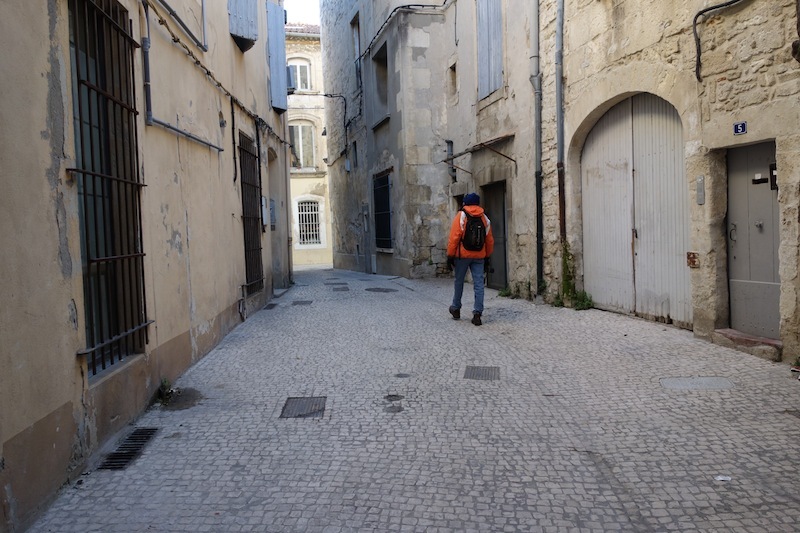 Tomorrow we drive south again and visit Le-Grau-du-Roi, Aigues-Mortes and Port-St-Louis-du-Rhone or, in my thinking, Grau, Aigues and Port Louis. Australians, and I’m no exception, like to shorten place names, eg. Bendy…Bendemeer, Coona…Coonabarabran, Gular…Gulamgambone, Kooty…Kootingal.